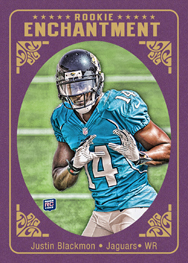 HC-MW Minimum Wage Est in U.S.
After a year as an online-exclusive product, 2012 Topps Magic Football sees the retro brand return to a more traditional hobby release. The release looks to cast a spell on collectors with three autographs per box, an old-school feel and rookies galore. The complete 2012 Topps Magic Football set has 275 cards. A 220-card base set is complimented by 55 short prints that fall every third pack. Every pack also comes with a Mini Parallel that mimics a similar format. Mini short prints fall two per box. Other mini parallels include Black Bordered (1:24 packs) and Pigskin Mini cards (#/50). 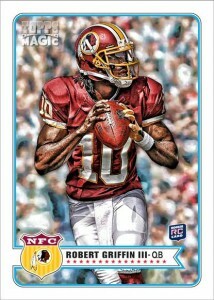 2012 Topps Magic Football boasts a comprehensive autograph checklist of more than 100 rookies and veterans. Basic signatures are paralleled by Black Border Autographs that are numbered to 5 copies. A limited numbered of Dual and Triple Autographs are numbered to 25. Six Autographs are numbered to 5. Inspired by the decades-old design '48 Magic Autographs include only hobby favorites and are limited to five numbered copies. Minis get in on the autograph action with a pair of sets. Basic Mini Autographs are numbered to 10. Mini Autograph Books add a new spin to the book card. The match up signatures from two stars and are numbered to 10. 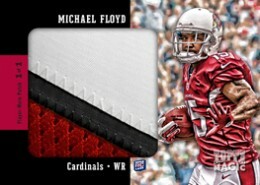 Relics are bonus hits in 2012 Topps Magic Football. Magic Relics (#/25) are exclusive to hobby packs. Magic Rookie Patches are all one-of-ones. A pair of relic sets embed real coins into the cards. Gridiron Coins (#/10) use veteran and rookie players. Historical Coins (#/25) add a little pop culture spin on 2012 Topps Magic Football, pairing a historical coin with a figure from the past. 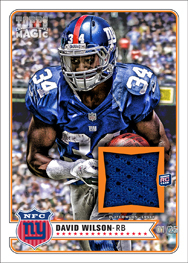 2012 Topps Magic Football has several inserts to keep set builders busy. 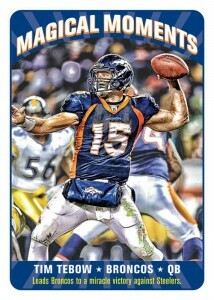 Magical Moments (20 cards, 1:6 packs) look back on the biggest plays and achievements of the 2011 season. Supernatural Stars (40 cards, 1:4 packs) spotlight the NFL's top veterans. On the other end, Rookie Enchantment (20 cards, 1:6 packs) focuses on the 2012 rookie crop. Charismatic Combos (10 cards, 1:12 packs) look at the best quarterback-receiver pairs. '48 Magic (20 cards, 1:12 packs) recreates the 1948 Magic design with today's stars. Hobby boxes have a total of 18 basic inserts. 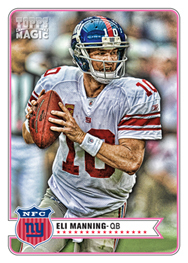 Get a real-time look at the 50 hottest 2012 Topps Magic Football cards. JIMMY GRAHAM 2012 TOPPS MAGIC AUTO AUTOGRAPH CARD! Good: Great photography. Great base card design. Monster autograph checklist. Short Printed base cards. Variety of mini parallels. Three autographs per box. Bad: Most autographs are stickers. Mini cards prone to dings out of the pack. Insert set designs not as good as base. The Bottom Line: 2012 Topps Magic Football is a nice product that gives you a little bit of everything. The base set includes current superstars, retired superstars and a wide variety of rookies. The mini set offers many different parallels, which is nice for the player and team collectors. Topps Magic also has a very large autograph checklist, which includes some rarer signers. The base design is fairly plain, but the cards pop because of the filter used on the photos. Because of this technology, it gives the cards a crisp, clean look. The cards have a similar look to the Topps Bazooka Basketball products that was made in the mid-2000s. An added bonus is that these cards are great for in-person or through-the-mail autographs since the surface of the card is smooth. The minis have parallels that aren't found on the regular base cards, including blue parallels, black parallels, and Pigskin parallels that have the feel like, you guessed it, a football. The Pigskin parallels are something different and is a very cool feature. The insert designs don't really jump out at you too much, but that might just be because I was raised on the fancy 1990's era of flashy, holographic inserts. Instead these have somewhat of a throwback look to them. The Magical Moments insert looks the best out of the lot. I'm less of a fan of Supernatural Stars and the purple coloring on Enchantment is not appealing. Charismatic Combos is okay, but I never really liked combo inserts too much. The autograph cards are identical to the base cards, aside from the sticker autographs on them. That said, it works. I like autograph sets that mimic their base cards because it gives you a bigger surprise when you happen to pull an autograph. The checklist boasts 275 base cards, consisting of current players, retired superstars and rookies. Cards 221-275 are short prints that fall 1:4 packs. This can make a base set challenging to complete, but not impossible. 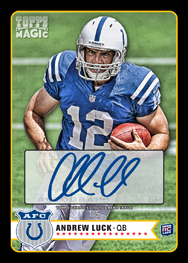 The autograph checklist is over 100 players deep, consisting of many current superstars as well as many of the big-name rookies like Trent Richardson, Russell Wilson, Andrew Luck and Robert Griffin III. The checklist also has tough-to-pull game-used mini-variations of many of 2012's top rookies. Overall, Topps Magic has a very nice checklist that isn't too big, but still produces lots of big names. 2012 Topps Magic Football has value in the sense you're guaranteed three autographs in every hobby box. But with such a large autograph checklist, your odds of pulling lesser named players are higher than they might be in other sets. On the other, that larger checklist also means several signers not common in other 2012 releases. The insert sets don't have much value behind them, but some of the mini parallels are solid. With rookie cards falling on average of 2-3 per pack, you should be able to accumulate a nice little stack of star rookie cards in every hobby box. 2012 Topps Magic Football is a reasonably priced product that delivers lots of fun and a handful of autographs in every box. With all of the mini parallels, each pack gives you that added bonus. With the set coming out after the season, it's easier to know what the impact rookies. Overall, this is a nice product, and one of Topps' best given the price point. 2012 Topps Magic #166- Ryan Tannehill Rookie Card! PSA GEM MINT 10! 2012 Topps Magic #RE-DM- Doug Martin "Rookie Enchantment" RC! PSA GEM MINT 10! 2012 Topps Magic #78- Doug Martin Mini Rookie Card! PSA GEM MINT 10! 2012 Tom Brady Topps Magic Mini SP Card #250! PGA MINT 10! ANDREW LUCK COLTS STANFORD 2012 TOPPS MAGIC #1 MINT RC ROOKIE #1 PICK ! I loved 2009 Topps Magic set and Ive been waiting for something like it since. I am so freaking excited cant wait sounds awesome! I’m a huge Topps fan.This just seems like its gonna be a real fun set to collect an makes for an awesome box break. I love when Topps does something out of the ordinary. I haven’t purchased any Topps Magic products before but I love what I’ve seen so far with the whole retro/throwback feel with other products like Heritage,Mayo and Turkey Red.Very excited about Magic 2012 and can’t wait till feb 8th! Is the release date still the 8th? Jon � Looks that way. Picked upa couple packs the other day. Has a Gypsy Queen “feel” to it. Looks fun. Prolly do it again. First off, I am aware of the long tradition Topps Magic has brought to the sports card world. So on that premise, I think Topps has done an excellent job with this new set. I would give them 5 stars for this effort. Personally, I’m not a fan of the design nor the feel of the back material of the card. Hence my 3 stars. Again, I’m aware that its a tribute to the long standing series. I did get 7 packs and found 3 Autos and a redemption card, so overall I was surprised by this. I look forward to other sets and I can’t wait for the 2013 season! Bad product, 4 blasters, no autos, no relics, no hits, no rg3, no Andrew Luck, just a bunch of useless rookies like Mohamad Sanu and Brandon Weeden. No T-rich, no Doug Martin, no Alfred Morris, Tannehill, Blackmon, nothing but crap!!!! bought 2 hobby boxes just to check it out, I was pretty happy for the fairly low cost, lots of RC’s, some cool inserts/sp’s and 3 auto’s per box is a solid deal for around $80-85 range. I would recommend this product to anyone, fun to open. I was kind of disappointed but yet still ok with it. The price of around 100 bucks for 3 autos is great…. however when all 3 autos are of garbage rookies its kind of pointless. Out of 3 Hobby boxes I got one serial card and no relics at all. Im done with this one until it hits a cheaper price. I would give it a rating of 3.5 stars if I could. I like the product. For me, it is a different way to present the same product as all the other cards out there. I got plenty of RC’s including Griffin III and Luck. The autograph cards I got are nothing too special, but that’s the way it goes. I bought one hobby box, and I’ll buy more packs on my trips to the card store. I have been out of cardboard for a while but my son has started showing interest in collecting so we took a trip to a local shop. Picked up a few mid 90’s product when the box of Magic caught my eye. I bought 2 hobby boxes and pulled the norm with topps products or so I thought. the minis were smoking and has really got me back in the collecting world. I’m old school and really appreciate topps effort to bring old school back. I got trents black border several lucks and rg3s. Autos were so so couple sp and a Reggie Wayne. Wish they had half stars this product deserves a 3.5 rating would have been a 4 if the autos were on card and were of higher level vets and a shorter list. Any product that you can pick the packs which do and do not have the “good” cards and which ones do not is crap. Topps should be embarrassed and ashamed of this release. I just opened 56 packs bought fron Ebay sellers – NOT ONE AUTOGRAPH. I first was intrigued to buy this product due to a Kappernick pull I could possibly have. I bought my first hobby box at the card store for $105+tax and it was $114!! I thought I got a great deal. Later on I realized I could buy hobby boxes online for cheaper. But back to the story. I bought one and so did my boyfriend, yes I’m a chick who loves cards so sue me. I had a few good pulls such as the Kappernick base rookie and a Luck Rookie as well. My boyfriend felt like getting the last box and opening it at home he pulled the Kappernick auto!!! We both wanted it however he doesn’t know as much about sports as I do and he is a Dallas fan!! He wouldn’t give it up. So after a few days of arguing and fighting I decided to buy another hobby box from eBay on the east coast. Low and behold my first auto I pulled was a Kappernick! I couldn’t have been more happy but I was. I pulled another Trent rich, 2 Andrew Luck rookies base cards and an RG3 mini. I love these Magic Cards and it’s worth buying the small 3 pack hangers and hobby Boxes. Sorry I am not able to tell you about the blaster boxes due to my stores never having them but I usually have the best luck. If you are buying individual cards on eBay, you need to realize that the person could have already gone through the box and pulled the autos. There are a guarantee of 3 in each Hobby box and all they are doing is making a profit off you. Just do yourself a favor and buy a hobby box. Best prices online are $80-85 don’t pay more than that! Would anybody know of a value of a mini autograph book MAB – LE andrew luck john elway double autograph…mint…numbered 3/5.. Anyone seen prodcut run numbers for this product I have been looking cant find them no where? NCKing � They were not released. I would give this 4 stars for such a great product the base cards were amazing and for the patches were so beautiful for just one blaster box. So I just started collecting after a 7 year hiatus about 5 months ago, and today I decided to pick up a “value box” of sorts for my local toysrus. It happened to be my birthday and I heard it was one of the few stores that carried 2012 items so I decided to try this box out instead of the overpriced topps. I found 11 packs of cards ranging from 2011 to 2013 including a rack pack of magic. I believe there were four packs altogether, still not sure which pack it was from but I pulled a 48 auto redemption of RG3 numbered to 5! Happy birthday to me! If these were truly retail I’m a little shocked, but my other packs weren’t bad either. I love the vintage look. It is a good product , but the problem is there are over 140 autographs !!!!!!!! That is just insane, makes it super hard to get the good names. 2012 Topps Magic Factory Sealed Football Hobby Box Andrew Luck AUTO RC ? ?